When we left off last week, London sent Gen. Loudoun in the summer of 1756 to take command of the North American operation, recalling Gen. Shirley back to Britain to face criminal charges. Due to the strategic mess that everyone had blamed on Shirley, not much of anything got done militarily for the rest of the year. Meanwhile, France had finally declared war on Britain in the spring of 1756 after Britain had been attacking French forts in America for most of 1755. The French had sent Gen. Montcalm to command French forces in North America and coordinate the French military response. Prior to the war, the British had built a line of forts from Albany to Lake Ontario. Fort Oswego was the final fort in that chain, sitting on the eastern bank of Lake Ontario, where the Oswego River connects to the Lake. In the last episode, I mentioned the fact that Fort Oswego was not really in much condition to be defensible in 1755. Originally built as a trading post, it just wasn’t designed to support a large force of soldiers. The British would need to make changes if they wanted to use it as a launching point against the French at Fort Niagara. One of the big problems with the fort was that it sat within range of several hills. An enemy needed only to carry a few cannons to the top of any one of these hills and start lobbing cannonballs into the fort. Given the limitations of 18th Century cannons, holding the high ground in a battle often met that you could hit the enemy but the enemy could not hit you. Therefore exposed hills near any fort always created a danger of the enemy taking the high ground and putting the fort at risk. We saw an example of this back in Episode 5 when the French simply used muskets on hills surrounding Fort Necessity to force Washington’s surrender. 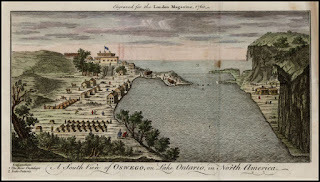 To counter this threat at Fort Oswego, the former Commander, Gen. Shirley had delayed any assault on Niagara in 1755 and instead focused on building a second fort on the hill next to Oswego, called Fort Ontario. At the same time, Shirley attempted to put together a force of 16,000 militia, raised across various colonies for the attack on Niagara. As usual though, the colonies balked at spending money or sending men outside their own colonies. Even so, Shirley worked through the local politics and built up support for the 1756 fighting season. He also planned to use the Regulars who had fled from the Braddock Campaign in 1755 and had been lounging around Philadelphia for a year. As Shirley planned his campaign during the winter and early spring, he received word that London was replacing him. As I discussed last week, Shirley had lots of enemies on both sides of the Atlantic. His lackluster performance during 1755, convinced officials in London that they should send replacement leaders. London selected Gen. James Abercromby and Gen. Daniel Webb to head up the New York Campaign. They also decided on Gen. Loudoun as the new commander of North American military operations. Although Shirley received word of the leadership changes in March, Gen. Loudoun did not arrive in Virginia until July. Even then, he would need more time before he would be ready to mount any sort of offensive. So for most of the spring and summer of 1756, new commanders attempted to plan new strategies or adapt old ones, familiarize themselves with the geography and military resources, and learn how to work with the local colonial political powers to get the support they needed. Loudoun wanted to focus on taking Fort Carillon at Ticonderoga. In August, he commanded Webb to take several regiments of regulars to Fort Oswego. The regiments had been prepared to move out for over a month, but confusion and delays resulting from the change in leadership delayed their orders. Before the Regulars could reach the Fort, it would be too late. While the British were taking their time getting their act together, the French decided to strike first. Gen. Montcalm had arrived in Canada in May 1756. He was itching to get to work and almost immediately began preparing an expedition against Fort Oswego. Like his British counterparts, Montcalm was a regular officer who disliked using militia or Indians in battle. Indians tended to be unreliable and were almost useless in the highly disciplined maneuvers needed to besiege a fort. Canadian Gov. 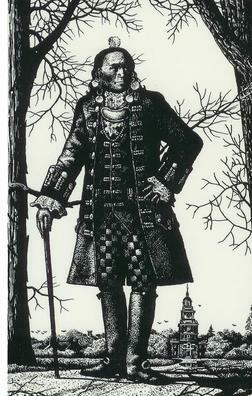 Vaudreuil disagreed with Montcalm and strongly encouraged the use of Indian raids to strike fear into the British settlers. Montcalm had only limited numbers of regulars at his disposal and agreed to use some militia and Indians in his offensive. He set off in late July, 1756 with about 1300 regulars, 1500 militia, and about 250 Indians from various allied tribes. Montcalm planned to use the Indians as guides and to scare the enemy out of the woods and back into the fort, but would use his French regulars for the actual siege. The British had little warning of all this. They were on poor terms with the local Oneida tribe, who failed to provide any warning of the French advance. The British also did not seem to do much any scouting of their own any distance from the Fort. As a result, their first notice that their might be a problem was when soldiers at Fort Ontario saw one of their comrades lying nearby, dead and scalped on August 10. Since Gen. Webb had not yet arrived at Oswego, British Lt. Col. James Mercer remained in command. Mercer sent out a ship to scout along the coast the next day, August 11. The scouts sighted Montcalm’s 3000 troops encamped only about a mile and a half from the fort. Within hours, Indian snipers were firing into Fort Ontario from nearby trees. A year earlier, Gen. Shirley had agreed with his military experts that Fort Oswego was virtually indefensible. If the enemy placed cannon on either of two hills overlooking the Fort, they could fire directly into the fort. The longer term plan seemed to be to build a new Fort Oswego on one of the hills, but for now that work was incomplete. Gen. Shirley had simply built small outpost fort on top of the other hill in order to prevent the enemy from occupying the high ground. That outpost was Fort Ontario, which was now under attack. Ontario had only a few cannons and a force of about 370 militia, mostly raw recruits with little military experience. The main body of soldiers at Fort Oswego could not come to the defense of Fort Ontario without leaving their own walls and confronting the attackers in the forest. So instead of serving as protection to Fort Oswego, Fort Ontario had simply become an indefensible smaller outpost that the French would have to capture before beginning their assault on Fort Oswego. The French were able to bring up their artillery to an entrenchment where they could fire point blank into Fort Ontario. 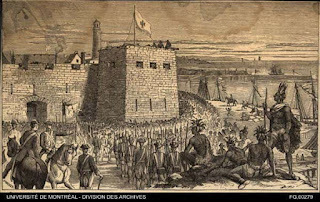 Since the assault would simply result in the deaths of everyone in the Fort, with no chance to fight back, Mercer decided to abandon Fort Ontario on Aug. 13, bringing those troops into Fort Oswego. That, of course, meant that the French now occupied Fort Ontario and the heights around it. All the work building Fort Ontario now meant that it gave the French better walls from which to launch their artillery barrage against Fort Oswego. Montcalm had his soldiers move their cannon into Fort Ontario and began firing into Fort Oswego. Oswego’s cannon were all on the wrong side of the fort, since they had planned on using Fort Ontario to protect that side. Now, they had to fire from the far side of Fort Oswego against their own former defenses, without any protective cover for themselves. The 1700 men in Fort Oswego were facing almost certain slaughter from the 3000 man attacking force that was bombarding them. Nevertheless, Mercer was not going to surrender the Fort that easily. An artillery duel continued for several hours until a cannon ball completely beheaded Mercer. At that point the second in command, Lt. Col. John Littlehales decided to ask for terms of surrender. In 1756, there were no real “rules of war” regarding surrender and prisoners. The first Geneva Convention regarding the protection of prisoners of war would not exist for more than a century. That said, European officers were not savages. They knew that terms given to a surrendering army would affect future decisions to surrender, and would also impact how they would be treated if they were someday found on the losing side of a battle. If the defenders of a fort had fought a gallant defense, the winner would often accord them the honors of battle. The losing army would be permitted to depart with their arms and supplies, their colors and a single honorary artillery piece. In this case, however, Montcalm decided that the defense was not sufficiently gallant. The fort’s defenses were pathetic and the defense of the main fort really only lasted a few hours. In fact, if the fort had been able to hold out for a few weeks, they might have been relieved by Gen. Webb’s reinforcements. Montcalm demanded that the garrison of about 1700 surrender as prisoners. He only promised that they would not be killed and would be conducted safely back to Montreal where they could later be exchanged for French prisoners. Seeing the fight as hopeless, Littlehales agreed and surrendered. Apparently though, the promise of safe conduct as prisoners was even more than Montcalm could deliver. Indians did not fight for the French for pay. Instead, they went to war for the purpose of proving their bravery by taking enemy scalps, and for profit by looting the property of the enemy. Fort Oswego was a trading post and supply depot for the British Army. In addition to cannons and small arms, it had a large supply of food, military supplies and other items of value. After the surrender, the Indian allies of the French immediately entered the Fort, looted anything of value, and got drunk on the Fort’s supply of rum. They also killed and scalped all of the wounded in the Fort’s hospital. Next, the Indians turned to the disarmed prisoners. They killed several dozen prisoners, which included many civilians, and took many more prisoner, with the intention of taking them home as slaves. Montcalm was mortified by the actions of his allies. He had given his word of honor to provide safe conduct and could not do so. He eventually put a stop to the slaughter, and agreed to pay a ransom to the Indians to return their prisoners. As a result, his victory ended up costing the French a lot more money than they had planned, and only encouraged Indians to kidnap more prisoners in the future. The incident also reaffirmed Montcalm’s view that Indian allies could often be worse than useless. What incentive did any British force have to surrender if they knew doing so would likely lead to slaughter or slavery? Upon hearing of the fall of Fort Oswego, Gen. Webb, who had been on his way to relieve the Fort, immediately went on the defensive. He ordered the next fort in line, Fort Bull, to be burned to the ground in order to deny it to the enemy. He then took the time to fell trees on the road as his forces retreated, making the roads impassible to a feared advance of Montcalm. Loudoun later criticized his subordinate for not even trying to determine if the enemy was advancing (they were not) before destroying a fort and running away. That said, the damage was done. British forces were now far removed from Lake Ontario as the fighting season of 1756 neared its end. So the results for 1756 were even worse than the year before. Not only had the British not gained any ground through offensives, they had lost ground in New York through the loss of several forts. Further, many Iroquois allies and local tribes began to support the French, seeing them as the more effective regional power. With the French now on the offensive, Indian allies of the French continued their raids well into Virginia, Maryland, and Pennsylvania, pushing back the borders of British influence..
Maryland refused to deploy any soldiers to the west. It retreated back to Fort Frederick and refused to participate in any military actions beyond that point. Virginia, still holding onto dreams of settling the Ohio Valley, made more of an effort. The House of Burgesses appropriated £55,000 and called on Col. Washington to raise a Regiment of 1500 men. Still refusing to pay soldiers a decent wage, the colony had to institute a draft. Conscripts, of course, were not terribly motivated and frequently deserted if given the chance. To make matters worse, the majority of the funds appropriated went to militia in the eastern part of the Colony. Leaders were more concerned about a potential slave uprising affecting their plantations, than about Indian raids affecting the poor settlers to the west. Washington’s western regiment, therefore, never received adequate food, clothing, or arms. Washington’s regiment did engage the Indian raids when possible. But the area was too large to defend effectively. Most Virginians living in the area who could, moved out and headed back east. 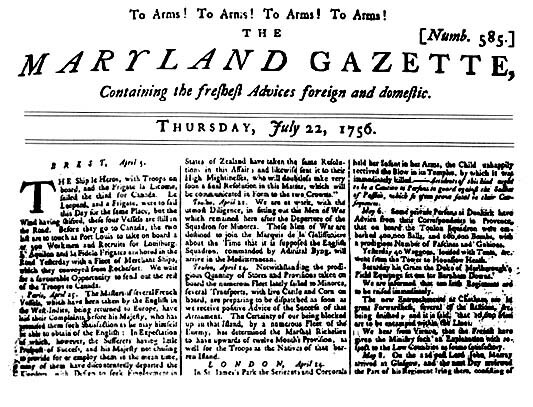 In 1757, Washington tried to convince Loudoun to convert his regiment into regulars and give him a commission in the British Army. Had he done so, it might have changed the course of world events. But Loudoun did not have enough confidence in the Virginia militia leader. Instead, he gave Col. John Stanwix, stationed in Pennsylvania, authority over Washington. Stanwix immediately demanded that Washington turn over much of his powder and ammunition for use in Pennsylvania. Between that and his own quartermaster’s embezzlement and the continuing desertions, Washington only faced frustration with the British refusal to reengage in the Ohio Valley. His disappointment at not being permitted to become a British regular would also sit as a deep wound that festered for many years. 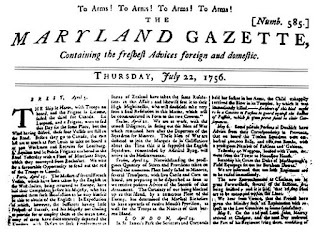 Like its southern neighbors, Pennsylvania was reluctant to spend much of anything on military defense even as the events of 1756 increased their exposure to attack. The Quaker government represented pacifists who held strong religious objections to war. Most of the colony’s money and power was in and around Philadelphia, which did not seem immediately endangered by the attacks. An ongoing fight between the Penn family (the Proprietors of the Colony) and the legislature (run mostly by Quaker leaders and Benjamin Franklin) kept everything in gridlock. The legislature did not want to levy property taxes unless they could also tax the lands controlled by the proprietors. The proprietors held the view that they were the owners of the colony and could not be taxed by those they had allowed to live there. The political wrangling thus led to inaction. In western Pennsylvania, Indians took advantage of this. Many of the raids were smaller ones against relatively defenseless frontier settlements. In July 1756, the Delaware attacked and destroyed Fort Granville, forcing all colonial forces to retreat back to Carlisle, near modern day Harrisburg. Indian raids continued to probe eastward, with some raids reaching within 70 miles of Philadelphia. The leader of the raid that destroyed Fort Granville was a Delaware Chief named “Captain Jacobs” who had only a few months earlier come to Philadelphia to plead for aid against the French. Receiving none, Jacobs allied himself with the French and became one of the fiercest raiders in Pennsylvania. If the attacks of the Western Delaware were not bad enough, the Eastern Delaware Indians, who lived just north of Philadelphia, were considering joining their western brothers. The Delaware were still upset about the land grab of the Walking Purchase and other encroachments. With the British on the defensive, the moment seemed opportune to recover much of their lost territory. Western settlers began literally carrying the dead bodies of friends and family killed in Indian raids through the streets of Philadelphia, demanding action. With the situation becoming desperate, the Pennsylvania legislature finally acted. Benjamin Franklin worked out a compromise to fund a military campaign. The proprietors would make a “donation” of £5000 in lieu of taxes. The legislature would pony up another £55,000 “for the King’s use” to avoid taking responsibility for spending on military. The money was available to the King who would presumably use it to defend the colony militarily, but that was the King, not the Quakers, spending on the military. The Quaker community generally found this distinction morally unacceptable. They excommunicated several members who had supported the compromise plan. In the end, most Quakers generally dropped out of politics altogether. They did not want to participate in the decision to go to war, but also did not seem to want to bear the consequences of refusing to pay for the war either. The result was men like Franklin and his non-Quaker friends taking control of the legislature and coordinating a military response to the continuing raids. A Pennsylvania raid to avenge Fort Granville attacked a small village called Kittaning where Captain Jacobs and his fellow warriors, along with their wives and children, were all killed. The massacre worsened things by motivating more Delaware to go to war against Pennsylvania, fueled by an increase of arms and ammunition from the capture of Fort Oswego. This only increased the Indian attacks in Pennsylvania throughout the fall of 1756. To prevent the Indian violence from spreading even further, Pennsylvania leaders tried to open a diplomatic dialogue with the eastern Delaware. Chief Teedyuscung was motivated to reach an agreement. The continued violence had purged the entire region of Indian traders, on whom the Delaware had become dependent. But for any agreement, Teedyuscung demanded that the parties revisit the Walking Purchase and guarantee a reserve of 2.5 million acres of land for his tribe in the Wyoming Valley, a region of Northeastern Pennsylvania around modern day Scranton. While the negotiations dragged on for months, the initial gifts and progress toward a solution kept most eastern Delaware away from active support of attacks. In December 1756, Loudoun sent British regulars to Philadelphia to help coordinate military defenses there. Even though the legislature was now on board for defensive action, it refused to provide housing for the soldiers. Loudoun was once again outraged at the treatment the provincials were giving his liberators. The locals, however, not only had more abstract Constitutional concerns, but the very real concern that a smallpox epidemic was spreading through the city. This was not a time to let strangers into your home. Loudoun had to threaten to take homes by force before the Assembly decided to convert a newly built hospital into temporary barracks for the soldiers. Thus, 1756 came to a close with the British still only seeing continued losses. Neither Parliament nor the colonial assemblies were willing to put up the serious levels of soldiers and money to fight the war properly. The North American Commander, Lord Loudoun grew continually frustrated at the colonies’ refusal to accede to his military demands. Next week: British setbacks continue with the Fort William Henry Massacre, and Britain decides to make leadership changes once again. Documents relative to the colonial history of the state of New York, Vol. 10 by John Brodhead (1853). The fall of Oswego (14th August, 1756): a chapter in British history, by W.T. Mercer (1873). Montcalm’s Crushing Blow: French and Indian Raids along New York’s Oswego River 1756, by René Chartrand (2014). Hello, in which episode did you discuss the difference between Whigs and Tories and what they stood for? I think you are looking for Episode 3: British Background. Thank you! I am enjoying your podcast! Keep up the good work!